Spring Training is almost here. It’s my favorite time of year. You’ll be able to watch or listen to the Brew Crew every day via television on FS Wisconsin (3 games), radio, or webcast. Please check the official Brewers Cactus League schedule for airtimes and outlets. The opener is March 4th on Brewers Radio. The first webcast is March 5th and the first telecast is March 8th. If you just can’t stand being away and are planning a trip to Phoenix, I thought I’d offer some insider tips for you. First, get your bearings. The Phoenix Airport is near downtown. There is a giant loop that surrounds Phoenix known as “the 101.” The Brewers facility is located in Phoenix proper (inside the 101, west of downtown) but is commonly referred to as Maryvale. If you’re staying a week or longer, renting a house/condo is the way to go. Call any Phoenix Realtor and you’ll have your pick. Furnished rentals are everywhere. 1. Biltmore Area: Inside the 101, centrally located near downtown/airport and a perfect location if you want to cover it all. 2. 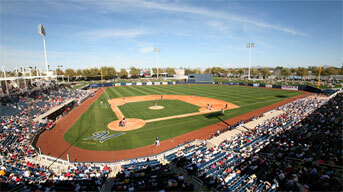 Scottsdale: Great location to cover Brewers plus East Valley ballclubs. 3. Glendale: Great spot to cover Brewers plus West Valley parks. I like the Westgate area in Glendale (near football stadium/hockey arena). There are a ton of hotels from 2-star to 5-star and the easiest access to Maryvale. 4. Peoria: THE hot spot in the West Valley for baseball fans. Hotels and restaurants on every corner. The Peoria Sports Complex hosts a number of night games as well so “doubleheader” days are much easier to accomplish when you’re night game ends close to your hotel/condo. 1. Don and Charlie’s, Scottsdale, an absolute must. It’s pricey but worth it. Great food in a mini-Cooperstown setting. Call for reservations. 2. Ajo Al’s Mexican Restaurant, affordable, multiple locations, muy bien! 3. Oregeno’s Pizza Bistro: Mesa, Tempe, Scottsdale. It’s been a family favorite for years but not a secret anymore. Don’t be in a hurry. 1. Take a trip to Sedona. Ninety minutes, north, from Phoenix, spectacular beauty…the famous Red Rocks. 2. Phoenix Zoo. Downtown location, very cool for kids. You can easily do the Zoo in the morning and the Brewers in Maryvale in the afternoon. 3. Hike a mountain. I’m partial to Camelback. As easy or difficult as you want it to be. 4. Golf: An embarrassment of riches if you want to tee it up in Phoenix. At Maryvale, down the right field line leading to clubhouse. One thing to remember, the Brewers usually take batting practice at Maryvale before road games. Your best bet is to find a night, road game on the schedule…then post up at Maryvale for batting practice three hours prior. Another smart thing to do is to check “B” games. Sometimes “name” pitchers work in the morning B-games. Position yourself near the front entrance of main office and maybe you’ll get the signature you’re looking for. My favorite ballpark is Maryvale. My favorite setting is Old Scottsdale. My favorite get away is downtown Cave Creek. If I was 21 again, I would be in Tempe every night. My favorite family road trip is Sedona. My favorite hangout is the Hyatt Regency Scottsdale. They’ve been known to take care of Brewers fans…Tell them “Brian Anderson sent me,” and demand a 20% discount on all food and beverage orders. That has been a popular question this winter. I have said many times, it wouldn’t surprise me if he hit .220 and made 20 errors. It also wouldn’t surprise me if he won Rookie of the Year! That’s the beauty of the Alcides Escobar era, set to begin in 2010. A rookie shortstop at the wheel of what many believe will be a contending ballclub. He is coming off an impressive late season audition in ’09 and most recently, a confidence boosting run in the Venezuelan Winter League. In 45 games for Cardinales de Lara, the defensive specialist made some noise with his bat, hitting .393 with 2 HR, 19 RBI, and 16 SB. From the Milwaukee side of the fence, Escobar faces plenty of pressure. He has the responsibility of inheriting a job at a key position at a young age (23 years old). He does so while replacing a wildly popular former All-Star shortstop in JJ Hardy, a mentor and friend to Escobar who was traded to the Twins to make room for the young challenger. From the Venezuelan perspective, Escobar’s homeland, he knows his place as perhaps the “siguente” (next one). Venezuelan shortstops have made a significant impact on Major League Baseball. Chico Carrasquel, Luis Aparicio, Dave Concepcion, Ozzie Guillen, Omar Vizquel…all icons, all baseball patriarchs for Alcides Escobar. Scott Merkin of MLB.com recently penned a great story on the thread that ties the great Venezuelan shortstops together. Omar Vizquel will play for Ozzie Guillen in Chicago this season. He will wear Luis Aparicio’s retired number 11. The Brewers had ideas of expediting Escobar’s trek to the big leagues early in 2009. In May, when Rickie Weeks required season ending wrist surgery, Escobar had first dibs at Milwaukee’s second base job. After a few games at the position in Triple-A Nashville, Escobar looked as awkward as Bill Schroeder at a Hannah Montana concert. It was obvious to everyone, that Escobar was no second baseman. But, is he ever a shortstop! He believes he was born to play the position. To carry a legacy at a position that made his country’s baseball players famous. He’s quick, he’s fluid, his speed and arm strength allow him to envision outs from angles that most shortstops don’t even consider. The last three years, Escobar has been under the wing of one of baseball’s great infield instructors, former Brewer Don Money. Ask Money about Escobar, He smiles and says, “Whew, you’ll see…” then laughs out loud, no doubt replaying images in a cinematic mind. Willie Randolph takes over Escobar’s tutorial now. Randolph guards his comparisons but get him talking long enough and out drops comparisons to Jose Reyes and Derek Jeter. Escobar is a natural born shortstop with tools to burn. Buyer beware, however. He’s young and he’s going to make mistakes. The impact of recent homegrown products like Prince Fielder and Ryan Braun has created a nearly impossible standard for the next wave of prospects. And fans cannot expect a JJ Hardy-like relationship with Escobar. He’s quiet and protective. He won’t be nearly as visible to an English speaking public as Hardy. He’s far more advanced understanding the language than he is speaking it. I was so impressed with him last year watching him prep for 30 minutes for a three question interview on FSN. He wants to be a presence with English speaking fans away from the field, but it will take some time. For Escobar, playing shortstop for the Brewers bears more responsibility than most Rookies. He’s waited his entire life for this chance and I think he’s going to do well. In 2010, Escobar has the potential to be as equally frustrating as he is exhilarating to watch. That’s why I say it wouldn’t surprise me if he hit .220 with 20 errors and it wouldn’t surprise me if he won Rookie of the Year…and you might as well throw in a Gold Glove with that order. Only time will tell. My message is to be patient.